How a computer seeks, interprets internet dance information and represents them as an artistic form, a form you can just get, not process. SPONSORSHIP & EXHIBITIONS: ITP SpringShow 2016, Google XStory Annual Showcase 2016, NYC Media Lab Annual Submit 2016.
restage wants to disrupt our perspective of finding and looking at dance. It is a data visualization and generative media creator powered by the Internet dance meta data that are produced by a web crawler. 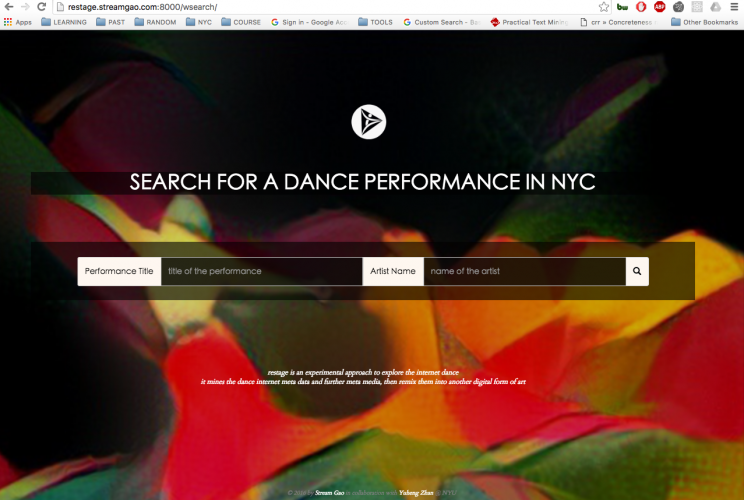 restage generates meta media for dance using web crawling, natural language processing and etc. Then represents these meta media by remixing them into different artistic forms. ReStage seeks to use storytelling and look for different artistic ways to tie the internet dance information together into new art forms. In order to open a new window for people to understand dance, and offer further inspirations. Current ways includes photo mosaic creation, mosaic gif and style transfer. ReStage contains several main parts: a dance data crawler, web search engine, visualization of text based information for each dance and a dance art collage generator. 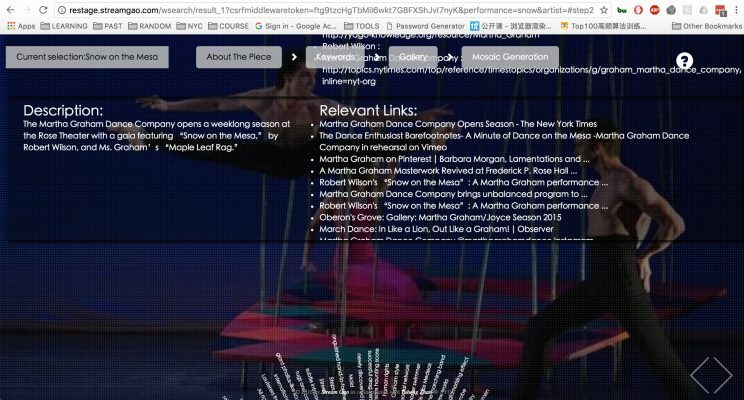 For each dance the information contains title, relevant artists name and links, NYT review links, other links, performance images, videos, and especially keywords and featured keywords. 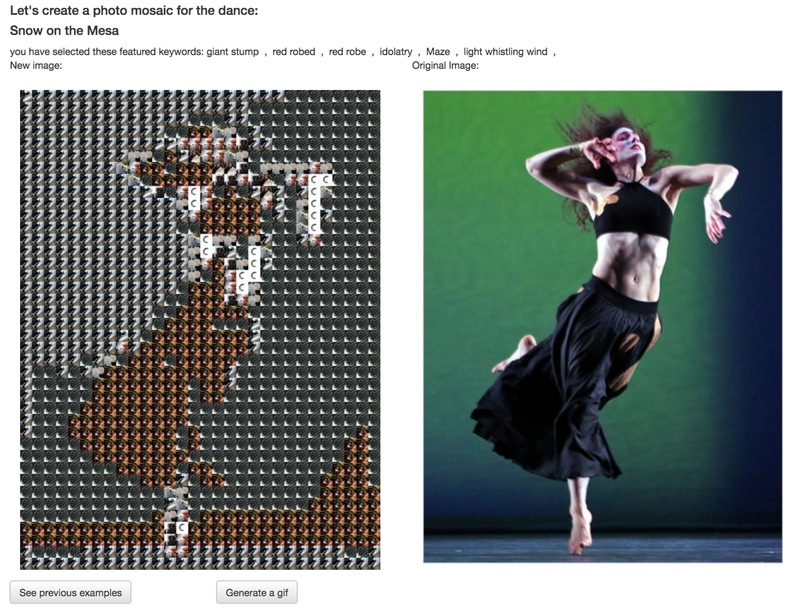 User could select featured keywords to generate a photo mosaic for the dance and then further see a generate gif. The result wants to assist the physical experience of seeing a dance performance, use elements that is not relevant to dance to describe a dance and help to open another window for people to interpret them. 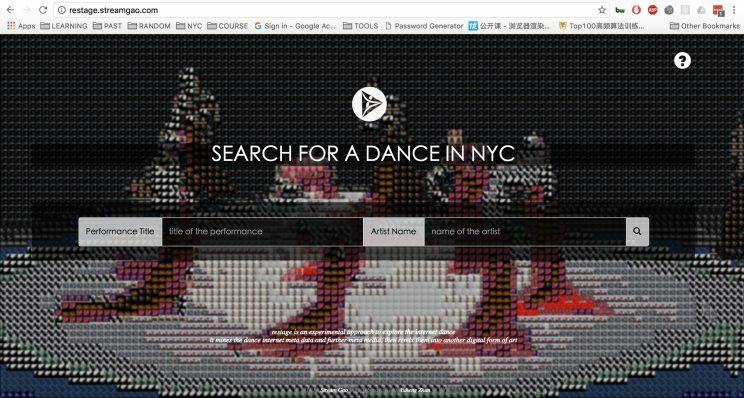 In order to collect Internet dance data, restage has a database/search engine specifically for New York dance performances. It starts from crawling the New York Times dance subject articles after 2007, extracting basic performance information(performance title, artists names, outlinks, keywords and so on) based on some typical dance review writing patterns and natural language processing. Then uses these information and further expands to collect other information as well as media include images and footages. Users can start from searching a dance performance by either the piece title or the artist names, like a famous choreographer or dancer. Then they will see the results. By clicking the blocks, users are further guided to see the details of each piece. ReStage tries to answer the basic questions from the data collection part that: What the piece was about and what is the choreographer trying to do? What movement vocabulary or style used? How did the audience feel? And what is the inspiration? ReStage uses some language processing methods to deconstruct these descriptive text information(review, description) into keywords/featured keywords. Strong objective keywords are further returns google searched featured images. ReStage then uses these 3 main source information/meta media: video, image and text to automatically generate different art collages for each dance. 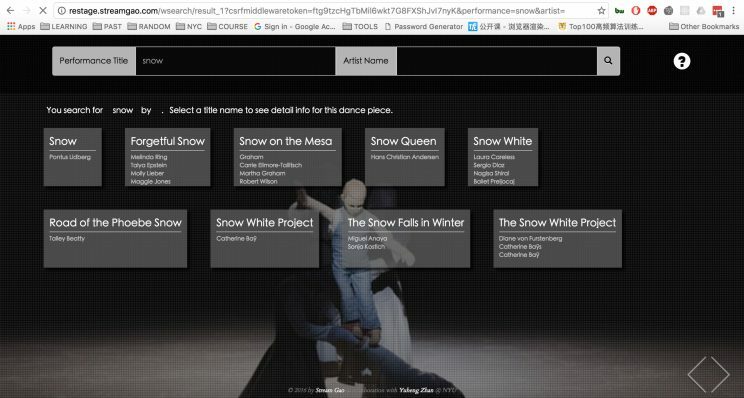 Users are encouraged to select interested featured keywords that describe the dance, a performance image and a threshold that indicates the number of division. 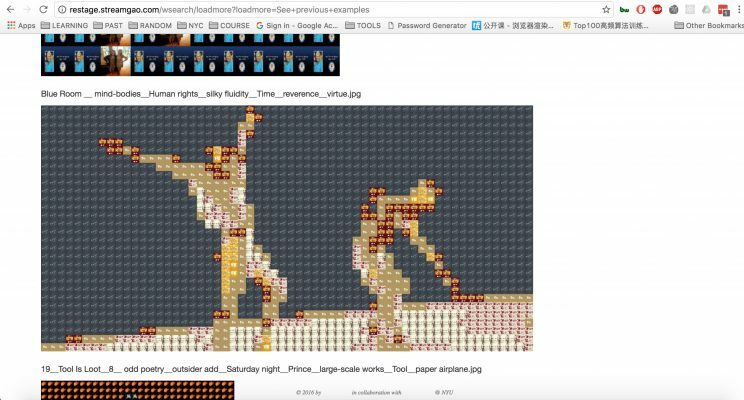 Then the performance image is recompiled into a mosaic image based off of pictures that are generated from a keyword image search. restage has another featured image database. After user selected featured keywords, if there was no featured image list in the database for a keyword, a google image search is called and update the database, then return a list of featured images responding to the selected featured keywords with RGB value. Images are decomposed into smaller segments that are made from featured images returned and replacing sections of base image with a similar overall color.